Just like with the tyres on your car it is important that you look after the tyres of your forklift. It is important your forklift tyres have sufficient thread depth. Tyre thread improves grip, fuel efficiency and improves the safety of the forklift operator. Most forklifts do not have a suspension system like a car so the entire weight of the forklift and its load are resting on the tyres. Worn tyres can cause your forklift to become unstable. This can cause a forklift to become dangerous for the operator and people working nearby the forklift. Knowing when to replace your forklift truck tyres is key. As stated above worn tyres can become a health and safety hazard. However when you replace them too early you will be overspending and increasing your forklift downtime. When you leave it too late the forklift becomes dangerous to operate. How quickly a forklift tyre needs to be replaced is depending on several factors. These factors are the hours of use, load carries on average, distance driven, type of surface the forklift is being operated on and how well the forklift is being operated. It is recommended that a forklift tyre needs to be replaced when the thread depth is less then 5mm above the 60J line. However it may also be possible to have the tyre re-grooved or re-cut when the thread depth is less then 5mm above the 60J line. If a tyre has reached the 60J line it must be replaced to prevent damage to the forklift and guarantee the operators safety. Insufficient tyre thread may also cause your insurance to be invalid. 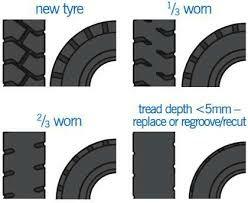 Below diagram provides you with guidance on forklift tyre wear.